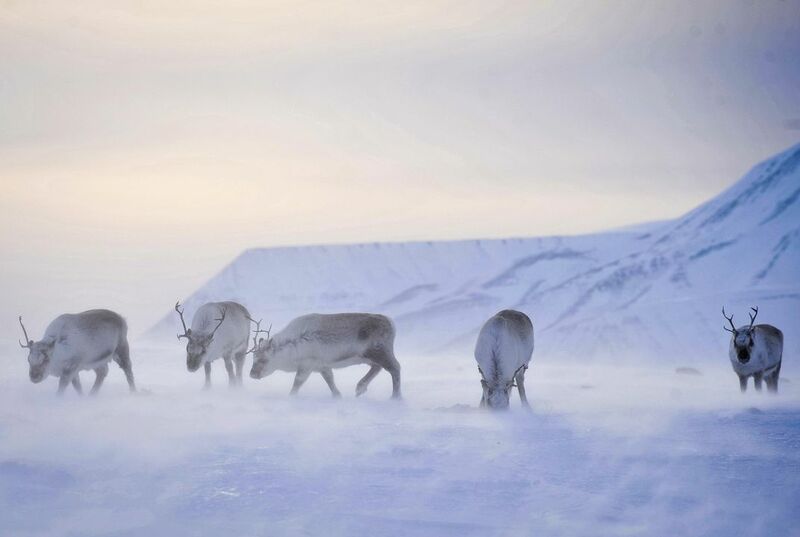 Reindeer living on the Arctic island of Svalbard are getting smaller and scientists say climate change may be the cause. Ecologist Steve Albon of Scotland's James Hutton Institute says rising temperatures in the Arctic mean Svalbard is getting more rain. The rain creates a hard ice sheet. The island's reindeer can't easily break through it to reach food. Reindeer populations are also increasing due to warmer summers. More reindeer stokes competition. Albon says researchers think there is a correlation between rising temperatures and reindeer weight. He says more research is needed to confirm the link. Their findings were presented Dec. 12 at a meeting of the British Ecological Society. 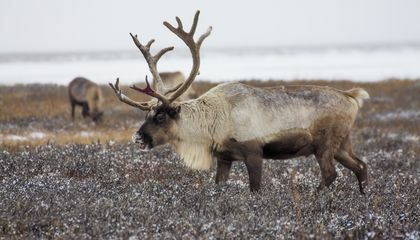 How is warmer weather affecting reindeer? In response to "Scientist say reindeer may be shrinking due to warming," I disagree that warming can shrink animals. I do not think it is possible for warming to take body weight away from animals. Another reason is they need a lot more test to happen before they can say that. It says in the article, "Scientists from Britain and Norway have found that adult Svalbard reindeer born in 2010 weigh 12 percent less on average than those born in 1994." This does not say anything about how many test the scientist ran to find this information. Even though scientist can make educated guesses, I think that you still have to run through a lot of test to find information like that. I think reindeer's are getting smaller because the warmer weather might be stunting their growth. In response to "Scientists say reindeer may be shrinking due to warming" I agree that the reindeer population could be shrinking due to sudden climate changes. One reason I agree is that with their natural food trapped in ice, there could be a rise in competition in food around the area with many reindeer. Another reason is that the rain can probably increase due to the changes in temperate. It says in the article "Ecologist Steve Albon of Scotland's James Hutton Institute says rising temperatures in the Arctic mean Svalbard is getting more rain," which proves my second point. A third reason is that with the reinder population rising, it could contribute to more competition for food and fighting. Even though people could think the reindeer population wont suddenly pummel down, I think it could. I agree with the passages opinion on why reindeer loosing weight due to the rain is creating ice sheets trapping their prey. In the passage it says, "The rain creates a hard ice sheet. The island's reindeer can't easily break through it to reach food." Even though they are starving, this does not necessarily mean they are going endangered. In fact, the passage says, "Reindeer populations are also increasing due to warmer summers. More reindeer stokes competition." This shows the population is increasing so they wont die off or go endangered. Warmer weather is affecting reindeer because it is increasing the population of reindeers. Due to "More reindeer stokes competition." It is also affecting reindeer by when the temperature rises in the artic it rains and creates a hard ice sheet. I think that reindeers are cool and I don't really get how they would shrink . I mean they are doing good where they are. In response to "Scientists say reindeer may be shrinking due to warming," I agree that the warm weather is affecting the amount of reindeer shrinking. One reason I agree is that if there is not enough cold places for the . Another reason is that if there is not enough cold weather for the reindeer the competition, or fights, will go up. It says in the article, "Reindeer populations are also increasing due to warmer summers. More reindeer stokes competition." A third reason is that since the temperatures are warmer they are getting more rain that will turn into slippery and thick ice when it finally gets colder again. It also says in the article,"The rain creates a hard ice sheet. The island's reindeer can't easily break through it to reach food." Even though these things could still happen when its cold, I think that the population of reindeer is going down because of warm temperatures. In response to "Scientists say reindeer may be shrinking due to warming," I disagree that reindeer are loosing weight just because of the climate. One reason I disagree is that reinder are a part of the food change, if they start dying out then the food chain will get messed up. Another reason is that the increase in the climate is bad, but add animals into the mix and it just makes it that much worse. It says in the article "adult Svalbard reindeer born in 2010 weigh 12 percent less on average than those born in 1994." A third reason is with the increase of reindeer going up, they are at a higher risk of competion. Even though with such warm summers reindeer population goes up, I think the climate increasing is still a very bad to. In response to "Scientists say reindeer maybe shrinking due to warming," I agree that that the reindeer are declining. One reason I agree is that because in Svalbard, where the reindeer live, it rains and turns into an ice sheet, and the reindeer can't break through it to get their food. Another reason is because of the climate's making the reindeer lose weight. Even though the reindeer aren't endangered yet, I think if this the climate continues to be like this, then the species will decline rapidly. i think its weird that climate change can stunt reindeer growth and that reindeer's might become overpopulated due to the warmness in the summer, within 16 years reindeer weight has decreased by 12 percent and it might decrease more in a few years. The warmer weather created more rain which created ice sheets making it harder for the reindeers to get food. I would shrink too if I couldn't eat.